Also known as Pterocladia capillacea (S.G. Gmelin) Bornet & Thuret and Branched Wing Weed (English). 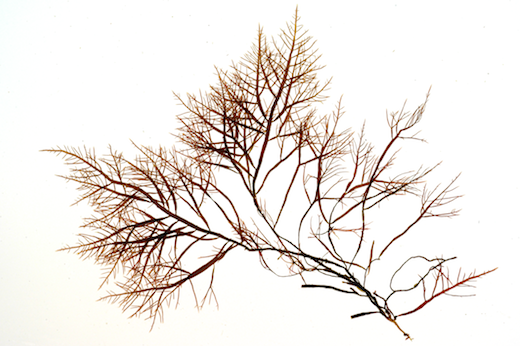 Description: Cartilaginous, dark purplish-red, flattened fronds, 2 mm wide, to 200 mm high. Pinnate or bipinnate, often bare at base (above), branches opposite or alternate, often tapering at both ends; distinctly pyramidal in outline. Fronds in loose tufts from a rhizoidal base. Habitat: In large pools and lagoons in the lower intertidal and shallow subtidal, widely distributed on south and south-western shores, never common. Similar species: Gelidium corneum, not included here, is known only a restricted number of localities in SW Britain (mostly Cornwall), although it is much commoner in N France, Spain and Portugal; this species is larger and relatively less flattened and requires expert identification. 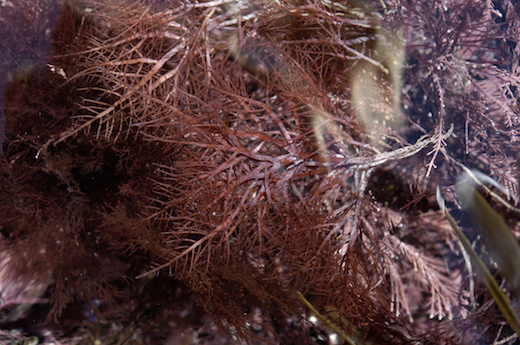 Key characteristics: Larger, darker and more purplish-red than G. pulchellum; normally, Pterocladiella is not found fringing the edges of pools like the latter. Main axes are generally more flattened and apices more obtuse than G. pulchellum. It is generally an elegant and beautiful plant. Site © M.D. Guiry 2000 - 2019. Important copyright notice: all text, design and photographs on this site are copyrighted by M.D. Guiry unless otherwise stated and all rights are strictly reserved. Click here for copyright information and contact. Website design: 249 Design Studio. Site maintained by M.D. Guiry (michael.guiry@nuigalway.ie). There have been 8736657 page loads since 1 January 2014 on 25 April 2019.